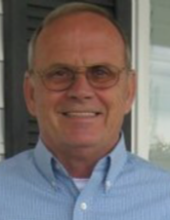 Philip Keith Stanton, 70, of Catlettsburg went to be with his Lord Wednesday, February 6, 2019, at Community Hospice Care Center, his family at his side. Mr. Stanton was born January 31, 1949 in Kenova, WV to the late Charlotte Neal. Philip was a graduate of Catlettsburg High School and retired in 2007 after 35 years from Amatek where he was Plant Assistant. He was former President of Catlettsburg Little League; his hobbies included UK Sports and woodworking, but most of all he enjoyed time with grandkids. Philip was a member of Oakland Avenue Baptist Church. Surviving is Philip’s loving wife of 47 years Alice Cornett Stanton, their children, Grace Massey, her husband Aaron, of Mount Olivet, KY and George Stanton, his wife Rachel, of Catlettsburg; four precious grandchildren, Keeley Massey, Natalie Massey, Cameron Stanton, and Cody Stanton; brothers, Ken Sutfin (Bonnie) of Catlettsburg, and Bill Stanton (Faith) of Catlettsburg. Funeral Service to honor Mr. Stanton at 1:00pm. Monday February 11, 2019 at Neal Funeral Home, 2409 Center Street, Catlettsburg. Pastor Mike Blankenship will officiate. Final resting place in Catlettsburg Cemetery. Visiting hours are 6:00pm until 8:00pm Sunday evening at the Funeral Home. In lieu of flowers donations may be made to Church Van Ministry, 3265 Oakland Avenue, Catlettsburg, KY 41129 or Community Hospice, 1480 Carter Ave, Ashland, KY.
To send flowers or a remembrance gift to the family of Philip Keith Stanton, please visit our Tribute Store. "Email Address" would like to share the life celebration of Philip Keith Stanton. Click on the "link" to go to share a favorite memory or leave a condolence message for the family.